At an area bright with awnings, banners and rows of hulking tourist buses, camera-laden tourists were being shepherded to the entrance of a theatre, where, the billboards proclaimed, the famous trance dance of Bali was enacted at ten am each day. It feels surreal to read this reissued tale of three travellers to Bali. 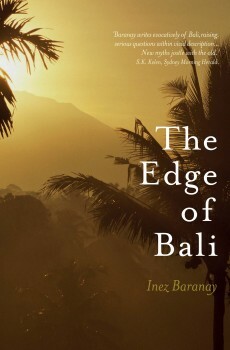 When The Edge of Bali was first published by Collins in 1992, the novel was groundbreaking because it explored the culture of tourism, tested the relationship between East and West and interrogated the notion of exotic. But now, in the aftermath of the Bali Bombings, I couldn’t help but read Part One through a different lens, one with an expectation of approaching doom. Try as I might to remember the book’s original publication date, the timelessness of Balinese life takes over, and the story feels as if it’s taking place today. As Nelson strolls down the Kuta pathways to the bar, her head filled with romantic dreams of the Balinese boyfriend she has come to reclaim, I kept expecting the author to have placed a terrorist’s bomb to destroy the idyll. Tyler, seeking a lost friend, is sucked into intrigue. Each of these three has hopes and dreams, and each gets a reality check along with unanswered questions about themselves. Seduced by the smiles, their delusions of a Balinese destiny and the ‘pretty promises of a new and meaningful life’ (p169) are shaken into clarity by time. They don’t ‘belong’ in the culture and their privileged origins mean that they never can belong. If you stay in any holiday destination long enough, you discover that for yourself. The Edge of Bali is a classic example of a book that should never have gone out of print. Congratulations to Transit Lounge for reissuing it! Sounds well worth reading, Lisa. Just confirming: the author is Australian? Good question about her nationality. According to the info in the book she’s currently living in Istanbul but her website http://www.inezbaranay.com/ says on the About Page that she was born in Italy but emigrated to Australia as a baby and her career was based here for 40 years. So I think we’ll claim her as an Aussie! And that gives me another option to complete my Australian Women Authors challenge this year. Bonus! Well done! Which other books have you read for the challenge? We were in London last weekend and had forgotten how full of tourists it is – mostly young, and mostly fiddling with their phones rather than looking at the sites around them. We so easily forget the impact of tourism on remote locations. I suspect for Bali the impact has not been all that good as with Hawaii. Perhaps the cities fare better. Nice review by the way. I’ve been away from commenting for a while and everyone’s comment boxes seem to have changed – they seem to insist I use a WordPress.com account now. I’ll have to look into it! I know what you mean about the phones. At our last meal in Singapore, there was a young couple at an adjacent table who (in the time it took for us to eat a three course meal) played with their phones non-stop and did not talk to each other at all. I thought that was rather sad.